Breckenridge is an old mining town founded during the "Pikes Peak Gold Rush" of 1859, turned ski town and home to the Breckenridge Ski Resort, a large Colorado destination resort offering something for almost everyone. 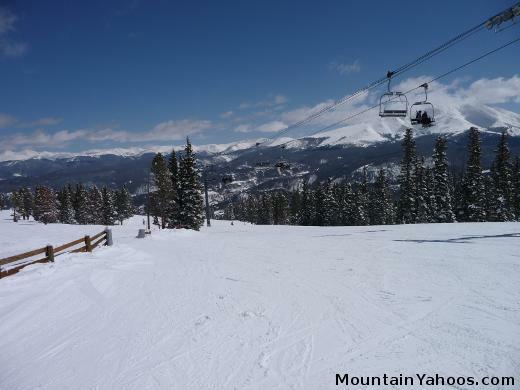 Breckenridge has four mountain peaks (Peak 7, 8, 9 and 10), three base village areas: Peak 9 base (Beaver Run and the Breckenridge Village), Peak 8 base (Ski Hill Place and Kid's Castle) and Peak 7 base (Crystal Peak lodge). 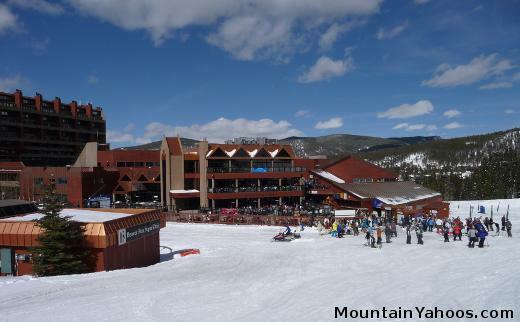 Breckenridge is only two hours from Denver International Airport off of I-70 to Hwy 9. This proximity makes it one of the most visited resorts in North America (especially during spring break). 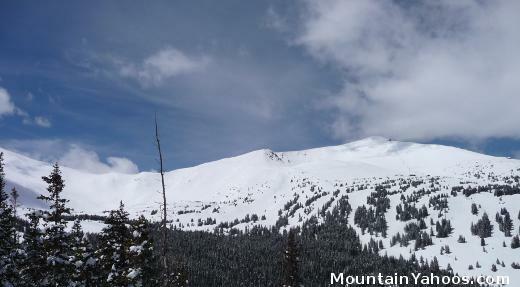 The vast majority of mountain is rated "Blue" or intermediate. The skill level of each of the four peaks segments the mountain and skiers so that each skill level tends to stick to their peak. 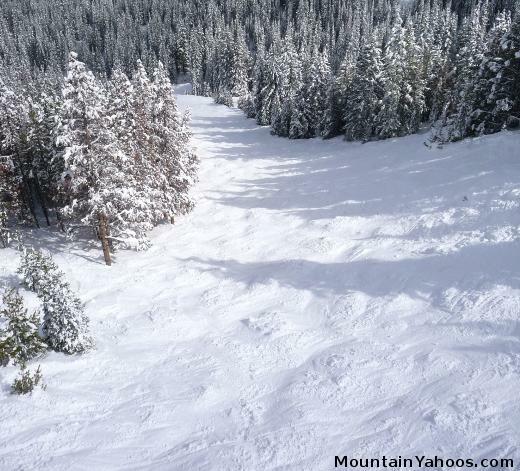 Peak 7 is exclusively Intermediate "Blue" runs. Peak 10 is exclusively advanced. 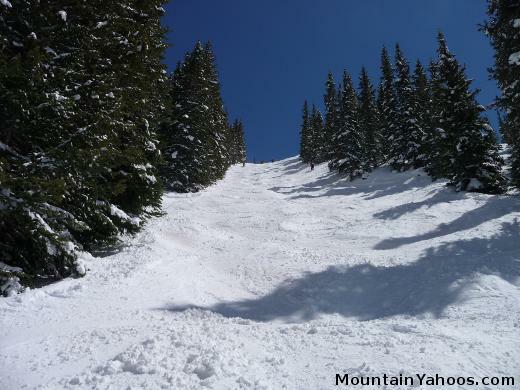 The upper part of Peak 8 and its bowls are all advanced as well as the back side of Peak 9. 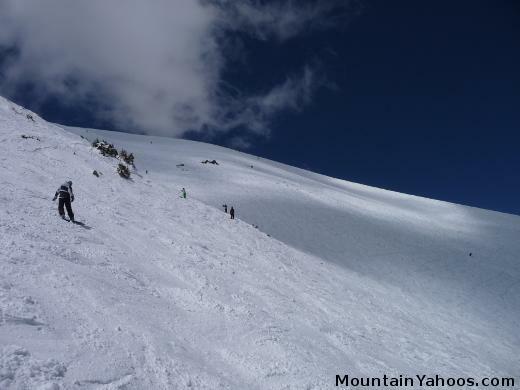 The front sides of Peak 8 and 9 are beginner "Green" and Intermediate "Blue" runs (thus getting back to the base is always easy). The mountain runs facing the skier at the bases of Peak 7, 8 and 9 at the three main bases areas are all pretty easy so as to great skiers with compassion. One will have to stray past these peaks to to hit the more advanced terrain. There are lots of blue cruisers with some black diamond runs on the upper bowls and off of lift 6 chair and Imperial Express (upper Peak 8) and E chair (Peak 9) with the trails just to the left off of lift. 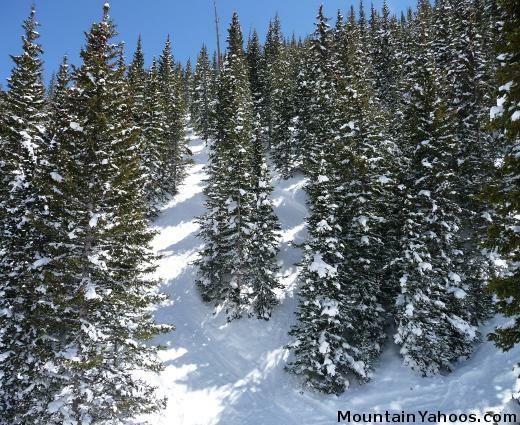 Some of the best advanced runs and tree runs require a hike such as those off of chair 6. E lift has a trail map insert (back side of trail map) showing "Mine Shaft", "Devils Crotch" which were two of my favorites. Under lift E was fun as it was avoided by the shy skiers who do not want to draw attention to themselves and the powder did not get skied off as fast. For those willing to hike past the top of E lift, you can ski the back side of 9, "Twin Chutes" and the trees of "Windows" where I found the last remaining powder on the mountain. 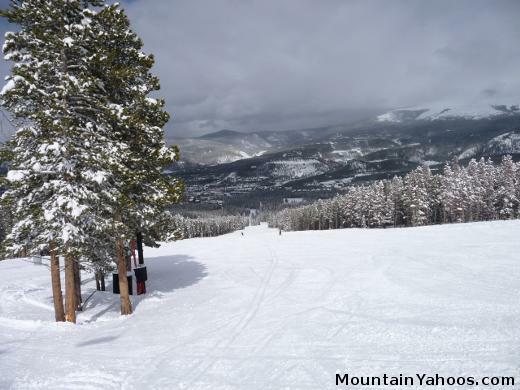 The advanced skier will have the most fun on the runs of Peak 10 (Falcon Chair), the bowls off of the summit of Peak 8 (Imperial Express Super Chair) or the back side of Peak 9 on the North slopes (Chair E). 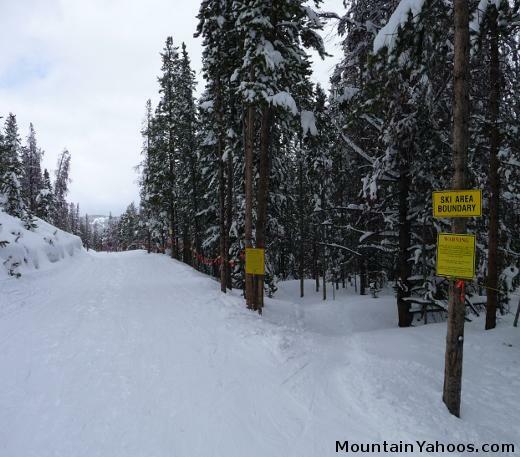 The rest of the mountain should be left to the beginner and intermediate skiers. 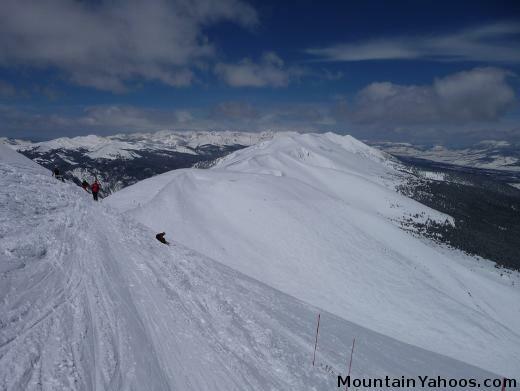 For extreme chutes, hike up to "Snow White" or "Lake Chutes" off of Imperial Express lift. Access to an "Out of Bounds" trail can be seen along "Flapjack". It did not seem to lead to anything exciting especially since nothing steep is accessible from here. 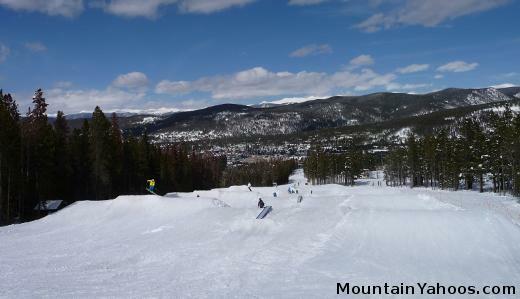 Breckenridge has four official terrain parks and with small to large features to support the beginner to advanced riders. Chair 5 will take you to all three of the Peak 8 terrain parks. 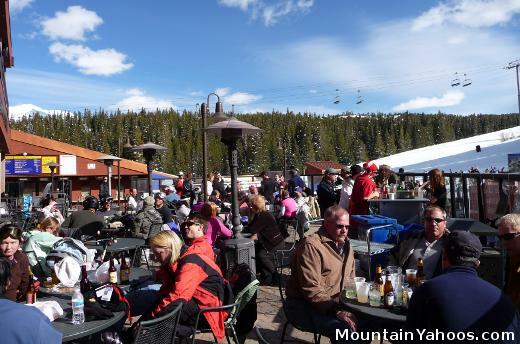 Post ski day activities at Breckenridge are most lively at the mountain base and often include local craft brews including those from Breckenridge itself. 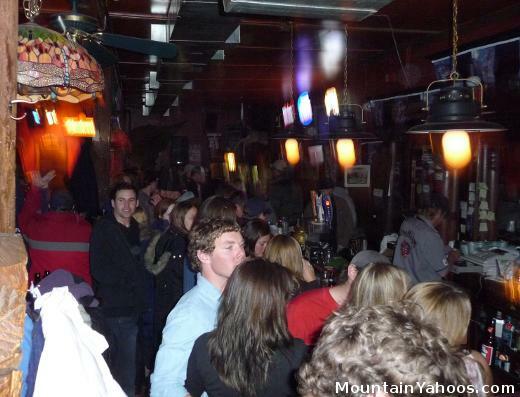 The "CopperTop Bar and Cafe" at the Beaver Run base and its patio are a sure bet for a pint on a nice day. The "Breck Brewery" has their own line of beers. The "Kenosha Steakhouse" has twenty craft beers on tap. One can also make the short trip along Airport Road to "Breckenridge Distillery" to sample locally made spirits. 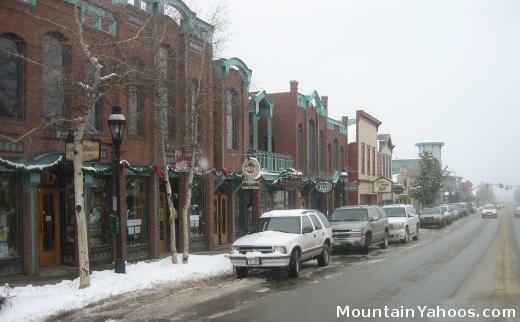 While the base villages have some shopping, you may want to save some time to check out the town of Breckenridge in particular Main Street and some of the side spurs. Note that the nearby town of Silverthorne has a large outlet mall with all of your favorite high end brands. The town of Frisco also has shopping but on a limited scale compared to Silverthorne. 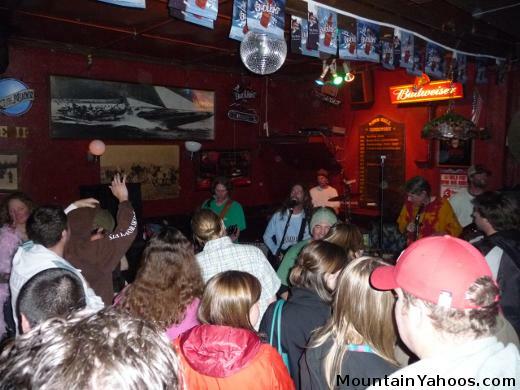 Gold Pan Saloon: Oldest liquor license west of the Mississippi. 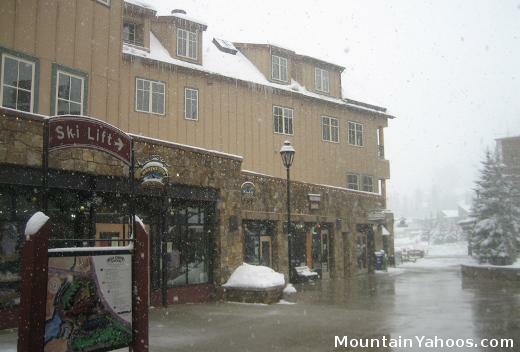 Lodging is available at the base of the mountain in the three main base areas (Peak 7, 8 and 9) or in town. 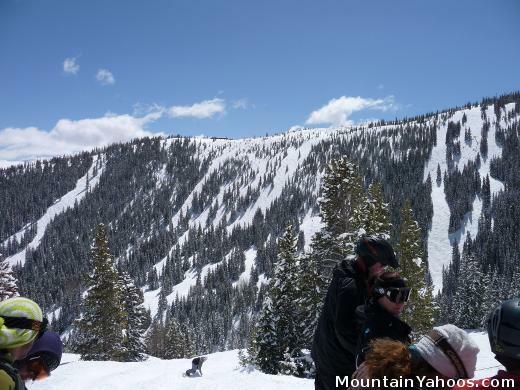 Frisco is also a nearby option if skiing other resorts in the area. 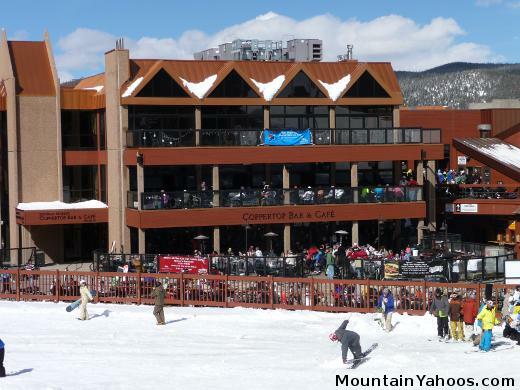 Also see Accommodations in the nearby town of Frisco Colorado.